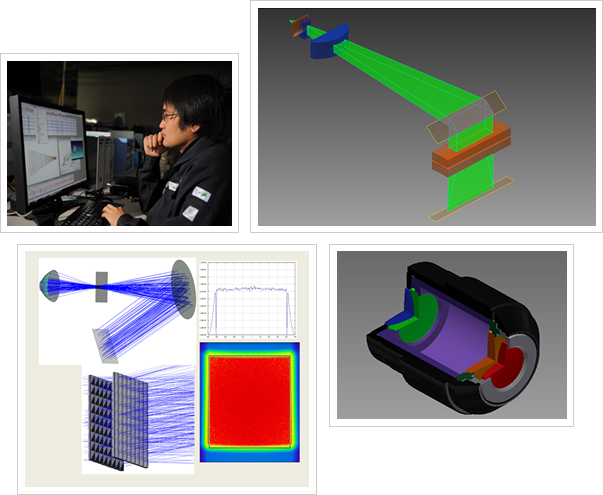 Natsume Optical Corporation (NOC) utilizes optimized optical system designs with the optical design software "Zemax". Critical for the lens manufacturing process. NOC also employs optimized Beam Homogenizing or optimized Line Beam optics, which are non-sequentially simulated. NOC specializes in Lens element mounting, as well as positional adjustment strategy, which are necessary for desired accuracy of the unit. Copyright(C) Natsume Optical Corporation. All Rights Reserved.